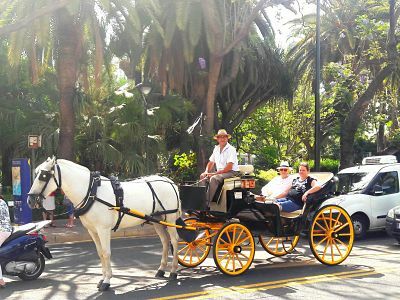 The most pleasant and relaxing way to experience the sights and sounds of Malaga in a beautiful Horse Carriage. When: Everyday from 9am to 4pm, every hour. Email us for a special request! 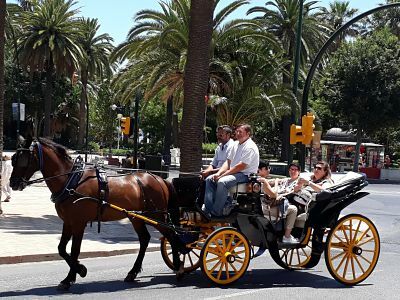 You will meet your local driver at the heart of Malaga's city centre and you will experience a lovely trip around the cathedral, the beach and the most important streets of Malaga. Delightful way to float through this beautiful town. 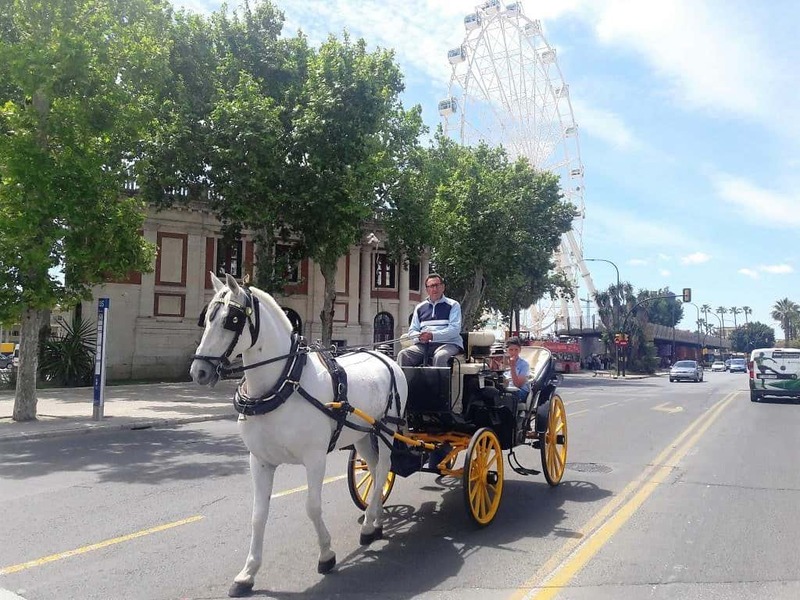 You just have to sit back, watch the people, the nature of the park and the beach, the happy running kids...The rhythmic trot of horse's hooves and the driver's friendly, interesting explanations will accompany you as you take in the most important monuments en route. Leisurely tour, giving a gentle breeze on a hot day and something to do if it is raining a little. Of course, this tour is perfect for a romantic date before dinner! You will love it! Extra time is paid extra. If you are late for your appointment, you will have less time to enjoy the route. Coches de Caballo will notify you if there is no availability at the time that you selected and propose a different one. If you don't feel comfortable with any of the proposed times, you can cancel your booking at that moment indicating so to Coches de Caballo and obtain a full refund. "Super fácil reservar a través de la web. Y el servicipaseo fenomenal y puntual. " "Por motivos personales no podia encontrarme con un amigo/cliente. Era su primera vez en Malaga y queria que disfrutara de mi ciudad natal. Esto fue lo que me escribo despues del servicio con Malaga Trips. "Rosario, We thoroughly enjoyed today! The horse and buggy tour with Pedro was more than enjoyable and he is a great tour guide. Rocio was most accommodating, a wonderful director, and always smiling!. Then the view and lunch at the AC Malaga Palacio was fantastic! Debbie and I are honored you provided such a wonderful memory for us. You are a superb hostess and we thank you deeply." Ha sido una grata experiencia tanto para la persona que ha recibido el servicio como para mi que lo contrate. Muchas gracias!" "Genial!!!! Regalamos este paseo a una pareja por su aniversario de boda y les encantó. Proceso de compra y reserva muy fácil y rápido. La persona de contacto de malaga trips fue a recibirlos a la hora y lugar convenidos. Muy eficiente y amable. El cochero fue encantador y divertido. Un éxito, mil gracias!! - Great!!!! We gave this walk to a couple for their wedding anniversary and they loved it. Purchase and reservation process very easy and fast. The contact person of malaga trips was to receive them at the agreed time and place. The coachman was kind and funny. Very very nice ride, thanks!" "This horse ride tour are our first experience and also we feel very fun. 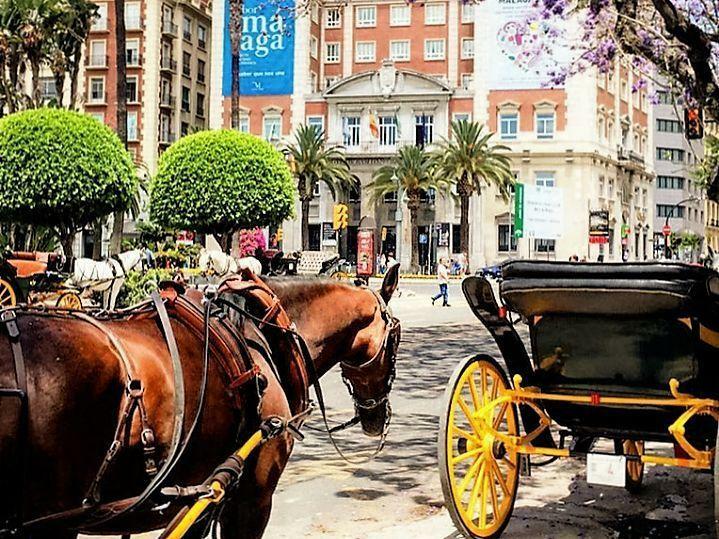 We think this tour are very Helpful to see around city center of Malaga. We will remember so long times." "It was a lovely tour. Our driver, Pedro, explained a lot of interesting things to us. I would definitely recommend it!" 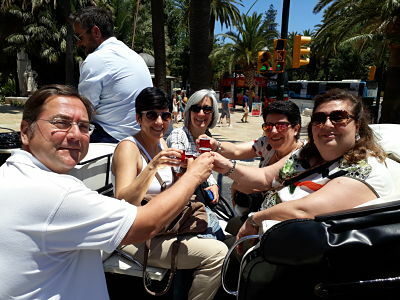 "Fantastic support from Malaga Trips. Trip booking was easy and we were met by a representative (which we did not expect) at the pick-up point, to check all was ok. She even took photos for us and sent them on afterwards at no extra cost. We will certainly use this company again. "